Bedrooms at this holiday villa in the Mexican resort of Tulum open onto expansive terraces overlooking the tropical forest and beach. Casa Xixim serves as a fully rentable guesthouse for large groups. It was squeezed onto a thin site by New York studio Specht Architects, which created a contemporary architectural aesthetic with white walls, timber panels and local stone. "This villa hotel, on a narrow lot fronting a protected bay in Tulum, Mexico, is designed to be fully self-sufficient, and to work in concert with its unique site," said the studio. With a mangrove marsh to the west and the beach to the east, the property is accessed from the road through a grove of palms. The path leads directly through the villa's openable living room, past its swimming pool and a vegetation buffer, onto the sand. Organised as a T-shape in plan, the building has two double bedrooms in its ground-floor wings and two more above the living space. Pullouts for children bring its maximum occupancy to 12. The downstairs suites open onto decking, while the upper bedrooms have access to L-shaped terraces facing the landscape. Sections of these large balconies are planted to alleviate stormwater flow, and plenty of spaces to sit are provided. A further outdoor space is located on the roof, shaded by rows of photovoltaic panels that help to power the home. "These elevated viewpoints provide another way to experience the surrounding environment," said Sprecht Architects, which has also designed a desert retreat in New Mexico. Casa Xixim's interiors, by Los Angeles-based Matthew Finalson, are kept simple to match the architecture. In the living area, louvered wooden doors slide back on two sides to open the space and provide cross-ventilation. Lining the end wall are hand-painted tiles, which add a local flavour along with furniture built in the vicinity. 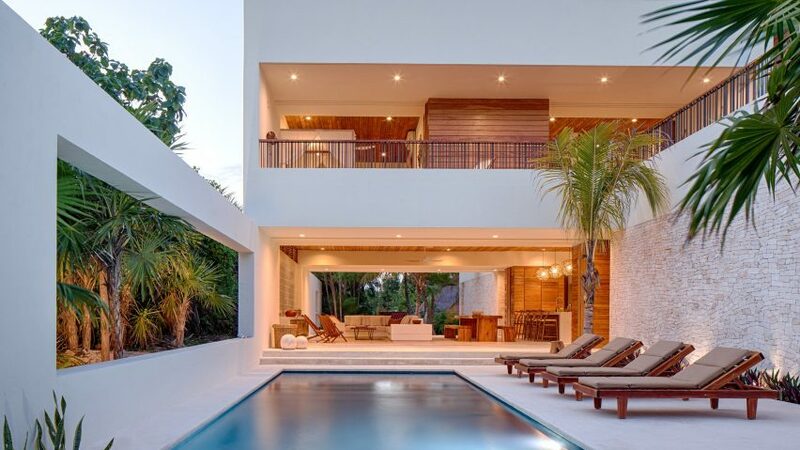 "Tulum-based craftsmanship is emphasised, with intricate stonework for selected walls, and site-built furnishings throughout," said the architects. Accommodation options are burgeoning in Tulum, which is become an increasingly popular tourist destination. An art-filled boutique hotel in Pablo Escobar's former mansion and a treehouse suite overlooking the jungle canopy are among other choices for visitors.